Purple = shinny jade guide, green = pearls. Then you need 3 scrolls of crystal ball. You go to the Blacksmith, pick the compose option, and put 3 of the 9 crystals in the slots, then get the scroll of crystal ball and put it in. Repeat this step untill you have 3 crystal balls. Note: crystal balls have a low success rate, so its best to buy them from other players for around 20mil each. - Get the 9 gems, and combine them together. 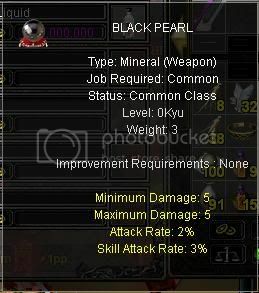 After you have combined them you should have 1 red jade, 1 clear crystal, and 1 daynaru (all with stats) success rate is 99.9% I believe. Next you need a scroll of fine pearl. 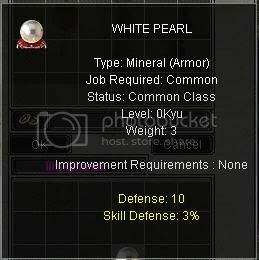 This can be obtained from other players for around 500 - 1mil each. You get the Scroll, with the 3 crystal balls, go to the local blacksmith, click on compose option, and then Put the items in the respective slots. Hit Compose and wish for the best. - Next you get the 3 combined gems and combine them together to make a shinny jade. Beware the success rate is super low. I believe it is 1/20 chance. GodSpeed. 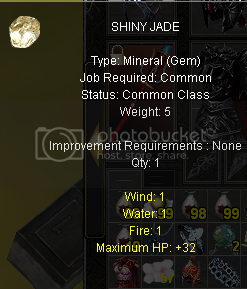 Note - Crystal balls, and Pearls, and shinny jades have a very low success rate, you will fail a lot. Also keep in mind PRICES ARE SUBJECT TO CHANGE!